In most situations, breaking things apart isn't the best way to solve a problem. However, sometimes the opposite is true if you're trying to characterize complex chemical compounds. That's what Sandia National Laboratories scientists Nils Hansen and Scott Skeen did to definitively identify pollution-causing soot precursors in a flame. The researchers discovered polycyclic aromatic hydrocarbons (PAHs) with aliphatic side chains, which have been hypothesized to serve as "seeds" for soot particles in engine emissions. "The role of these molecules as soot precursors has been hypothesized, and there is indirect experimental evidence of their presence on the surface of soot extracted from flames," said Skeen. "Until now, however, no one had definitive experimental proof of their existence as stable components in the flame." Working with former Sandia postdoctoral researcher Brian Adamson and Lawrence Berkeley National Laboratory's Musa Ahmed, Hansen and Skeen published the discovery in the Journal of Physical Chemistry A. Funding for the research came from Sandia's Laboratory Directed Research and Development program, while Ahmed is supported by the Department of Energy's Office of Basic Energy Sciences. The team used an analytical technique called tandem mass spectrometry—using an instrument provided by Lawrence Berkeley Lab and customized by Adamson—to detect gas-phase polycyclic aromatic hydrocarbons with aliphatic side chains in flames that produce soot, something never done before. 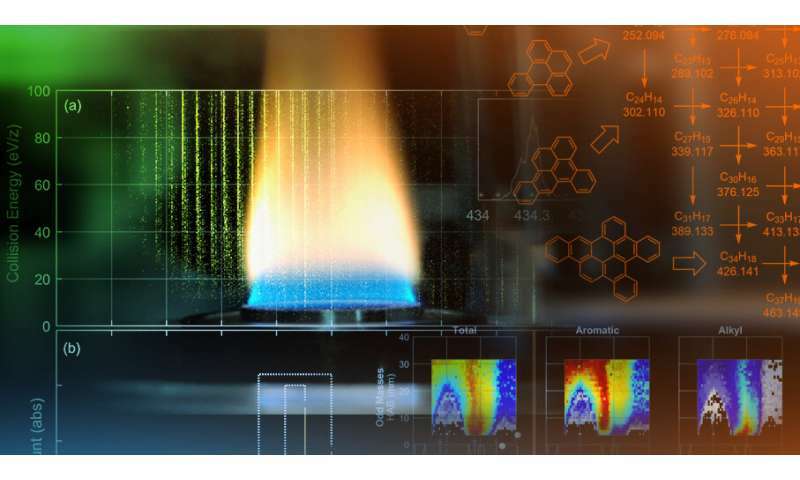 The device removes an electron to charge, or ionize, large molecules sampled from the flame, measures the molecules' masses then further identifies them by characterizing how the ionized molecules crack apart. "Without the tandem component of this new mass spectrometer, each molecule's mass is obtained but no information about its structure is revealed. You see something at mass 78, at mass 128, and so forth, but you don't know which molecules are represented. You just use your chemical intuition," Hansen said. "Think of a mass spectrometer as an instrument that sorts a container full of mixed nuts based on the weight of each individual nut, but at the end you still don't know whether you sorted peanuts, hazelnuts or walnuts." "Normal mass spectrometry can tell you how many atoms of each element are present in a molecule, but it won't tell you anything about how those atoms are joined together," Adamson said. "Tandem mass spectrometry with collision induced dissociation isolates molecules of a single mass and then breaks them apart. The way they break apart provides clues as to the structure of the parent molecule." "In a candle, the wax moves up the wick and then vaporizes before burning in the surrounding air. The flame appears yellow because soot particles get very hot as they move through the flame," Skeen said. "In this configuration, it is impossible to sample soot particles or molecules that lead to soot formation without disturbing the flame because a probe must be inserted through the flame sheet. "To overcome this problem, we generated a flame in which the air is in the center of the flame with the fuel on the outside," he said. "This way, we can probe the gases of interest from the outside of this 'inverse' flame. This is perhaps the first time that such a flame has been attached to a tandem mass spectrometer." Engine manufacturers typically use computer simulations to improve engine designs. They model the fuel injection, combustion and pollutant formation processes. Skeen said that better understanding of how soot compounds are produced—specifically definitive identification of polycyclic aromatic hydrocarbons with alkyl chains attached—should lead to models that more accurately describe the effects of engine design parameters on emissions and efficiency. 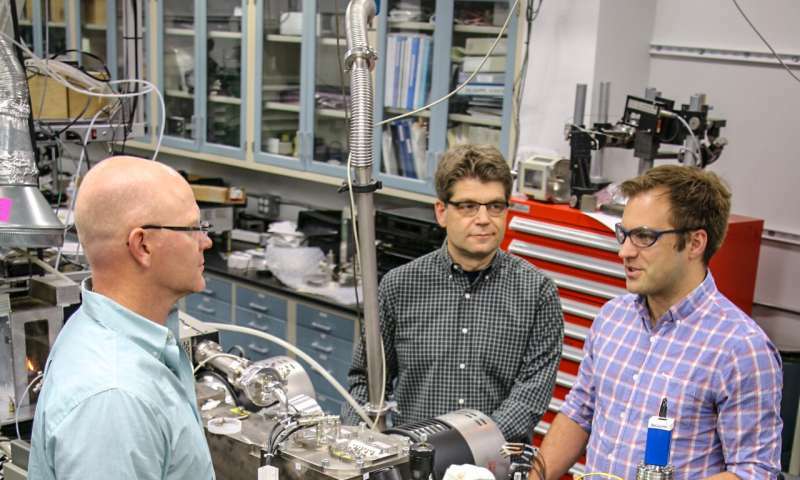 "If we can understand the chemistry, we can develop a model that will allow engine designers to optimize fuel injectors, air flows and the shape of internal engine surfaces, among other things, that will keep these compounds out of the atmosphere," Skeen said.